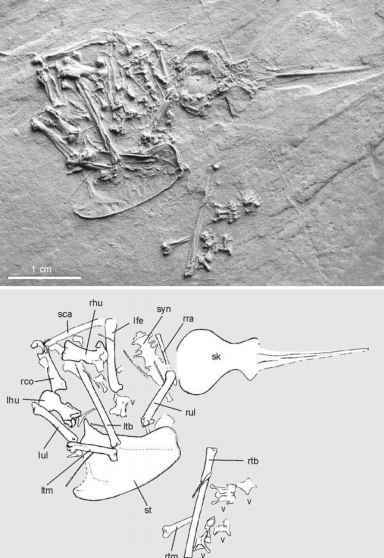 Another problematic taxon is Gradiornis walbeckensis Mayr, 2007, a species from the late Paleocene of Walbeck in Germany, which is represented by few bones only (humeri, coracoids, and tarsometatarsi; Mayr 2007a). The referred humeri resemble those of the Ameghinornithidae, and the distal ends of the tarsometatarsi are also similar to those of the Cariamae. The peculiar and characteristic morphology of holotypic coracoid, however, is not matched by that of any other avian taxon. The bone has a very straight shaft, lacks a foramen for the supracoracoideus nerve, and, in contrast to the bone in the Cariamae, exhibits a deeply excavated scapular articulation facet. Gradiornis further lacks the derived, block-like hypotarsus of the Cariamae, and its phylogenetic affinities are unresolved. A tentatively referred notarium consists of two fused thoracic vertebrae; if it indeed belongs to Gradiornis it would constitute another feature in which the taxon differs from the Cariamae. The elongate and robust tarsometatarsus indicates that G. walbeckensis was a terrestrial bird, and the humerus morphology suggests weak flight capabilities.